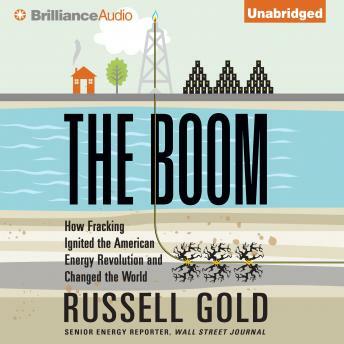 Russell Gold, a brilliant and dogged investigative reporter at The Wall Street Journal, has spent more than a decade reporting on one of the biggest stories of our time: the spectacular, world-changing rise of “fracking.” Recognized as a finalist for the Pulitzer Prize and a recipient of the Gerald Loeb Award for his work, Gold has traveled along the pipelines and into the hubs of this country’s energy infrastructure; he has visited frack sites from Texas to North Dakota; and he has conducted thousands of interviews with engineers and wildcatters, CEOs and roughnecks, environmentalists and politicians. He has also sifted through reams of engineering reports, lawsuit transcripts, and financial filings. The result is an essential audiobook—a commanding piece of journalism, an astounding study of human ingenuity, and an epic work of storytelling. Fracking has vociferous critics and fervent defenders, but the debate between these camps has obscured the actual story: Fracking has become a fixture of the American landscape and the global economy. It has upended the business models of energy companies around the globe, and it has started to change geopolitics and global energy markets in profound ways. Gold tells the story of this once-obscure oilfield technology—a story with an incredible cast of tycoons and geologists, dreamers and drillers, speculators and skeptics, a story that answers a critical question of our time: Where will the energy come from to power our world—and what price will we have to pay for it?